The echosounder offset can be used to correct the difference between the depth outputted by the echosounder, and the real depth. This offset is also called static or fixed draft. Dynamic draft (depending on the speed of the vessel) can be corrected when processing your raw data files. The transducer of the echosounder measures the water level from the bottom of the transducer to the bottom of the river. The height of the water which is above the bottom of the transducer has to be added to the echosounder output, and can be entered here. so in this case you do have to disable this option, or you can use it for other corrections. Before starting your hydrographic survey, you have to enter an offset for the echosounder. To do so, select "Preferences..." from the "Option" menu. The value entered is added to the depth (both high and low frequency depths) reported by the echosounder. To subtract from the sounders value (in case of depth below keel), just prefix the value with the minus sign "-". 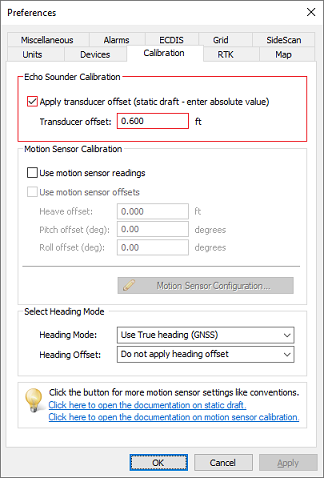 To disable the correction, just remove the tick from the "Apply Echosounder Offset" checkbox. Please make sure the echosounder offset is measured and entered into the software before recording any data. The depth written in the raw data files is the depth corrected with the echosounder offset ! 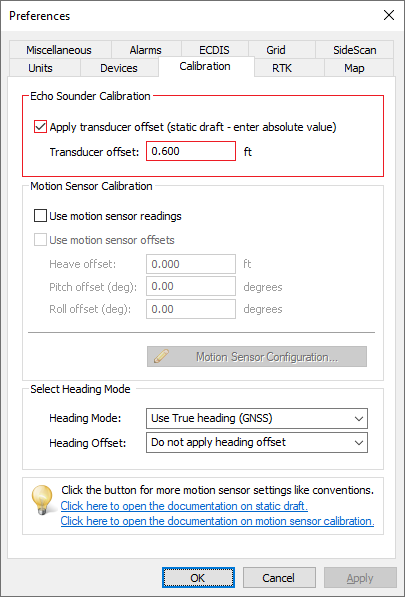 When you are measuring the elevation of the river bed using a RTK receiver, and the offset between the transducer and GPS antenna is fixed, you can just enter this offset in the RTK settings tab. However, we recommend to fill out both the antenna and transducer offset separately in case you ever need the absolute water depths. When using a NMEA0183 compatible echosounder, whether to enter an offset depends on the NMEA0183 sentence(s) used to retrieve the depth data, as well as the settings entered into the echosounder. $SDDBK Depth below keel Enter the distance between the keel of the ship and the water surface. $SDDBS Depth below surface No correction is needed, as the depth is measured from the water surface. $SDDBT Depth below transducer Enter the distance between the transducer and the water surface. $SDDPT Depth The offset configured in the echosounder is used.